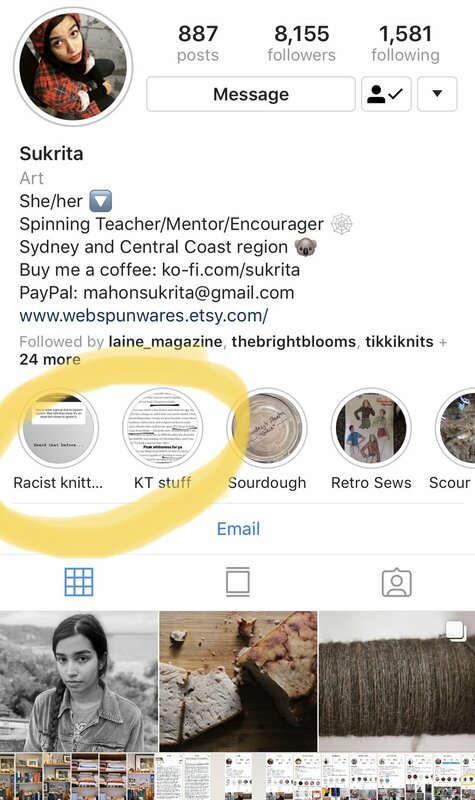 This week has seen a great deal of emotional labor exerted by BIPOC (Black and Indigenous People/Person(s) of Color) and allies regarding racism and white privilege within the fiber arts and crafting communities. I’ve shared below the accounts of some of the people who have really lead this long overdue conversation on diversity and inclusion. These individuals have used their Instagram stories and posts to lay out—and comment on—the tone-deaf and racist event that played a part in this sea-change; shared about experiences of racism that BIPOC face frequently in this community; provided incredible education about white privilege and struggled with and witnessed to white folks who are coming to terms with new concepts (which is really not their job so thank you thank you thank you);* and have collated and listed fiber artists and crafters to follow and engage with. These individuals, and others who have been involved, are amazing. Period. I know I don’t get many readers in this space, but I encourage anyone who is reading this post to get clicking and dive right in, especially if you are white or benefit from light skin privilege. *Buy these folks coffee at the ko-fi links under their profiles (if they have a ko-fi account). Another very cool and critical idea is the #buyfromBIPOCchallenge and @buyfromBIPOC Instagram account, spearheaded and co-moderated by @little_kotos_closet,** @smilelaina, @yokeandbore, and @slow.themme. **A quick note on @little_kotos_closet: she is my activist parent style icon and an absolute rock-solid account to follow. Also check out her story on WOC makers on Instagram. Scarves and a pillow from SUNDAY/MONDAY, a textile brand established by Nisha Mirani and Brendan Kramer in 2017. Their mission is “to design and produce handmade textiles honoring India’s rich craftsmanship traditions of weaving, block carving, printing and dyeing by partnering with textile artists.” Nisha is the daughter of Gujarati immigrants and dreamed of starting a business rooted in community and craft. At SUNDAY/MONDAY, the textiles are designed by Nisha and Brendan and then produced by weaver and block printing families in Gujarat and Rajasthan with their input. 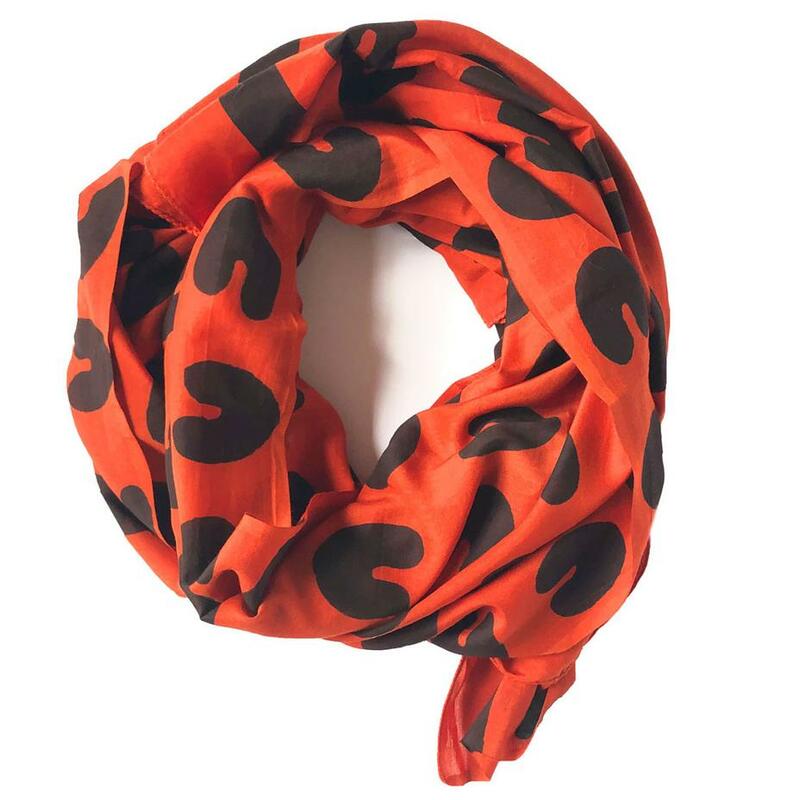 The name “SUNDAY / MONDAY comes from a phrase used in India to indicate the duality of textiles. Oftentimes, an Indian textile is reversible, with a different pattern or color scheme on the other side. 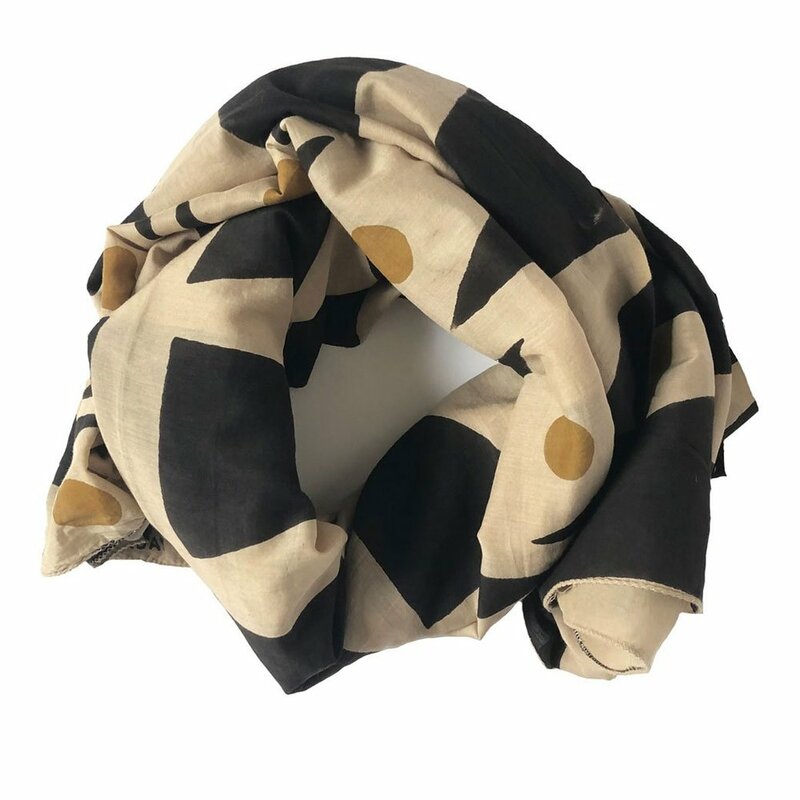 In a practical sense, textiles can be multi-functional - serving as art, rugs, or throws.” I have been wanting a block print scarf for quite awhile and I think one of these is in my future. Project tote from Bookhou, a multidisciplinary studio established by Arounna Khounnoraj and John Booth in 2002 that emphasizes natural handmade materials and small production pieces. Arounna received her education from the Ontario College of Art, Nova Scotia College of Art and Design and a MFA from the University of Waterloo and explores pattern and image in her textiles and sculptures. I’ve been using a basket and linen grocery store bags for my knitting for the last few years, but have been wanting to upgrade to something designed to hold my crafting tools. This project tote is currently sold out, but I’m hoping it will be back in stock soon! Earrings and a ring from Slantt Studio, a small sculptural line of jewelry designed and handmade by Jennifer Rodgers and founded in 2013. “Slantt jewelry is modern and distinct, designed with an intention to create pieces that are timeless. Architecture, sculpture, objects, textiles, and natural forms serve as inspiration behind the design.” All Jennifer’s pieces are fabricated and finished by hand using traditional metalsmithing techniques in her studio in Austin, Texas. I want those earrings so bad. Powerful tees from Green Box Shop, a custom social justice t-shirt company founded by Kayla Robinson in 2016 and promoting authenticity, inclusivity, and awareness. Kayla decided to start this shop when she couldn't find any bold social justice tees and sold them to raise money for her yoga instructor certification. Since then, Green Box Shop’s mission has grown and the company supports and ever-growing and evolving body of artists, activists, and creators. There are many shirts and causes to pick from but here are four that I really liked. I also want to highlight some BIPOC crafter/style icon Instagram accounts I follow and love (some new to me and some I’ve loved for awhile). Many of these crafters are designers and have shops, too. I know this work to address racism and raise up inclusion has been—and will continue to be—ongoing. I am committed to work on waking up to my privilege and racist habits, to listen, to educate myself, to apologize and recommit to the cause when I mess up, to sit with discomfort, to struggle with my peers, and to show up for social justice. In short, to do my part in the work it takes to live in a truly anti-racist and equitable world. Thank you for reading. Front and back panels: I knit these longer than what the pattern calls for since I didn't want a cropped look. Back panel: Did absolutely no shaping on the back panel as I wanted this to have more of an A-line loose fit. I knit it to be slightly longer than the front panel by a few rows. Sleeves: Did only a few increases since I have small arms and didn't want wide sleeves. I had to mess around with the sleeve cap shaping given that I did not have the same number of stitches as the pattern. Stitching it together: I love the look of a split side seam at the bottom. The two panels didn't quite match up so it was good that I'd pre-planned keeping the ribbing separate. Overall, I really like this sweater. The lapped shoulders are very fun and nothing I've ever done before. I'm super into it! More images and info about the pattern over on the project page.